Be the first to hear about their new releases and deals. Download the Booksprout app and search for Elisa Keyston today! Elisa Keyston is an author of sweet romance with hints of magic, intrigue, and suspense. 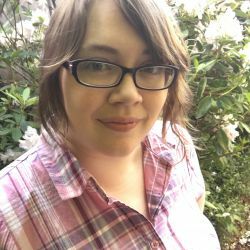 She's the series lead on The Pioneer Brides of Rattlesnake Ridge, a shared-world historical romance series from Sweet Promise Press, and she's also the author of the Northwest Magic series, a sweet contemporary romance series with hints of magic and mystery set in her home state of Oregon. When she’s not writing, Elisa spends most of her time gardening, collecting gnomes and fairies for her backyard, and fawning over her furbabies.